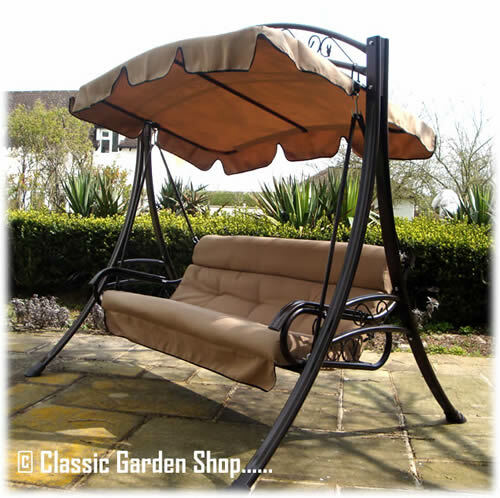 Cast and wrought iron patio / Garden furniture UK. NEW RIMINI SWING JUST ARRIVED. 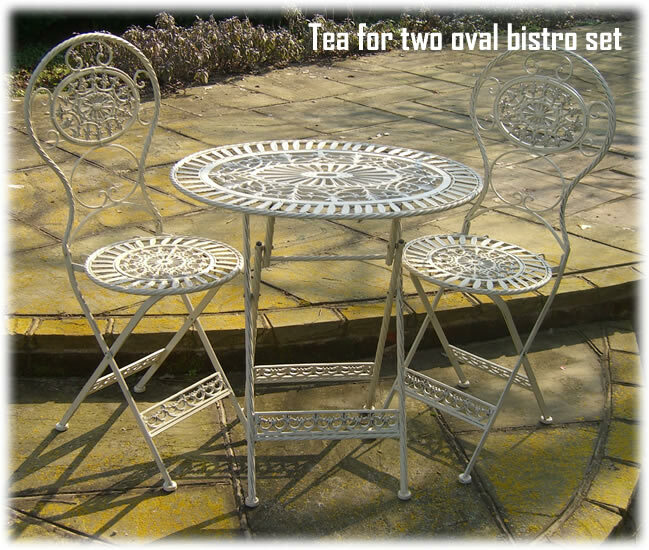 Tea 4 Two Oval Bistro set. A beautiful complement to any small corner of the garden. This Bistro set has a 72cm x 52cm folding table and two gorgeous matching folding chairs. Finished in an "antiqued" cream. Rose pattern cast iron patio Bistro set. *Seat cushions also available for this set. The Daisy cast iron furniture Set. A superb set comprising of an 80cm 2 tier table, two carver chairs and a carver bench. 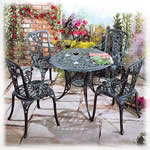 Cast iron rose patterned patio furniture set comprising of 4 carver chairs and a 90cm diameter table. *Seat cushions & additional chairs also available for this set. One of our latest models representing excellent value for money. Comprising of a cast table measuring 180cms x 90cms and six Rose pattern chairs. One of our latest models representing excellent value for money. Comprising of a cast table measuring 180cms x 107cms wide. and six matching carver chairs. Gorgeous Victorian style cast iron bench measures 100cms wide. All our cast garden furniture is coated with an enamel paint finish. Maintenance is simple, wipe over first with a damp cloth then a dry one. Any abrasions and paint chips that go down to the bare cast iron can be touched up with enamel paints (available at most DIY stores) and a fine artist brush otherwise oxidisation will occur. Cast iron is characteristically highly sensitive to moisture and will oxidise in the crevises of castings. In time you may wish to re coat your furniture, although most people prefer the more natural look the castings take on. Paints are available in both tins or aerosols.